In the coming months, we will profile the ministries, journeys and hopes of some of the congregations which are part of the Scottish Anglican Network. We begin with the courageous congregation in Harris in the Western Isles. We left the Scottish Episcopal Church in November 2017 and are enjoying our new freedom under Bishop Andy Lines, writes Rev Daniel Davies. 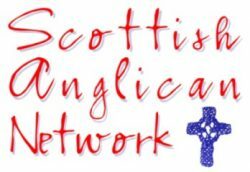 We are proud to stand with the other churches of the Scottish Anglican Network, which we joined at its beginning in 2005 as a voice for the faithful. It’s now a lifeboat for bereft Anglicans. 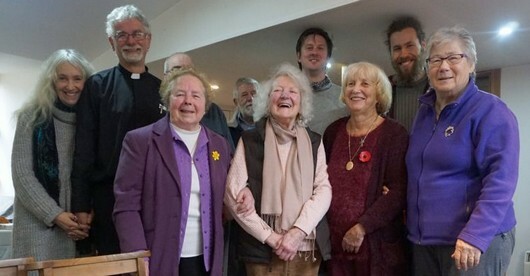 Rev Daniel Davies and the vestry of Christ Church, Harris, before leaving the Scottish Episcopal Church. We are a small church on a small island with a population of two thousand. Being small it’s been easy for us to move quickly, but it has meant sacrifices. When I came twenty years ago it was a house church. We bought land, built a church with vestry, kitchen and toilet, equipped it with hand-made furniture and artifacts, much of it donated, including a superb silver chalice and paten. We also built up bank account of some £30,000. I am a self-supporting priest! In November we had to walk away from it all. We are now starting again, but we have no regrets. The Church is not about money, possessions or security, it’s about the Truth of the Gospel of Jesus Christ. We can’t serve two masters. There can be real joy and freedom in letting go. A house on the High Street in the middle of Tarbert has been offered to us. It’s the port, main settlement and tourist hub. We have set up the church in a large high-ceilinged room which was once a shop with its own front door, now blocked off. It seats twenty and is fully equipped. The side wall has double doors opening to another room that can seat more. The is also a double garage that could one day be converted into a purpose-built church seating thirty-five. It certainly seems that as one door closes another opens, moving to this new site from our previous rather remote location seems to have been a blessing. We have enjoyed great support from our Presbyterian and Roman Catholic friends, and at Christmas we were joined by members of the Free Church. We were packed out. With Easter fast approaching we will see our holiday congregation as families with second homes return, along with tourists. However, this brings the need to reach out to our communities and signal our presence. We need a logo and have devised one inspired by the Byzantine icon of the Resurrection in the ancient Chora church outside Constantinople. 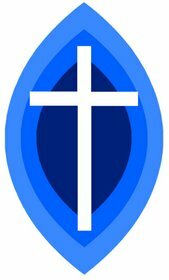 The logo (like the icon) carries the colours of the Scottish flag, yet also in the symbolism of the original speaks of Jesus Christ; risen, ascended, glorified. These two elements, united in one, proclaims this as a faith of and for Scotland. We offer it as a provisional emblem for use here, until a wider gathering of our churches, at a future date can choose its own. We in Harris are looking forward to that day. • Holy Communion is held at 11 am on Sundays at Allan Cottage, 1 Main Street, Tarbert, Isle Of Harris HS3 3DJ. If you would like to support the ministry on Harris or get in touch with the congregation, please contact us.